Limestone, as used by the minerals industry, is any rock composed mostly of calcium carbonate (CaCO3). Although limestone is common in many parts of the United States, it is critically absent from some. Limestone is used to produce Portland cement, as aggregate in concrete and asphalt, and in an enormous array of other products, making it a truly versatile commodity. Portland cement is essential to the building industry, but despite our Nation’s abundance of limestone, there have been cement shortages in recent years. These have been caused in part by a need to find new areas suitable for quarrying operations. 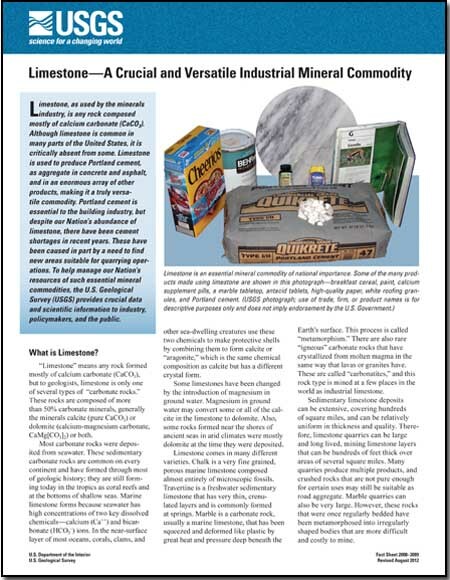 To help manage our Nation’s resources of such essential mineral commodities, the U.S. Geological Survey (USGS) provides crucial data and scientific information to industry, policymakers, and the public. Download this report as a four-page PDF file (fs2008-3089.pdf; 4.6 MB). For questions about the content of this report, contact Jim Bliss. Download a free copy of the current version of Adobe Reader.